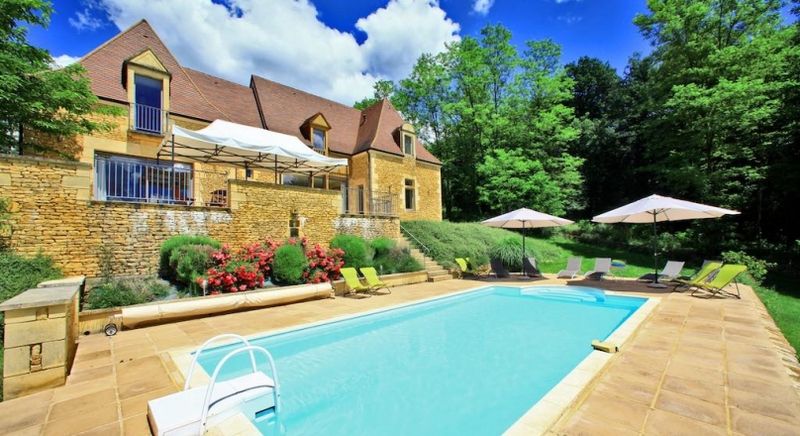 This charming house of 300m2, has a southerly aspect is near Lascaux and Sarlat. From 1260 € per week for 12 people. The house opens on a large south facing terrace with a barbecue and teak furniture furniture under a sunshade awning. The terrace overlooks a large (9 m x 5 m) private heated secure swimming-pool. There are sun loungers and parasols provided. A fully equipped kitchen opens out onto the terrace and adjoins the dining-room. There is a large (60 m2) living room with leather sofas and a feature stone fireplace. There is a TV area with Satellite TV, DVD player, HiFi system. There is also a large opening onto the terrace. There is a ground floor bedroom (two 80x200 cm electric beds), with private bathroom including a bath with shower over it and toilet. Upstairs are five large air-conditioned bedrooms (each with two 80x200 cm electric beds). Two have private shower rooms and toilets and reamining three share two shower rooms and toilets.